All pictures on this post were from google searches. 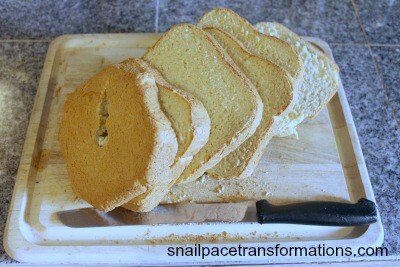 None are my own because I already gave away my bread machine when I started this blog. I have tried to give credit for them in the caption. Often, when I tell people I bake bread, someone will mention sheepishly that they own a bread machine. They think it’s something to be embarrassed about, or that I’ll look down on them somehow. They are usually surprised to learn that when I was first starting out baking, I had a bread machine. Mr. Bread Maiden and I received it as a wedding present. I found it invaluable during my first year of baking. Our first Thanksgiving after we got married, I made stuffing using bread machine bread. I was so proud of myself. Most bread machines these days are under $100, so it’s an economical first step if you want one (it’s about the same price as a cast iron dutch oven). 1. High chance of bread success. I’ll admit sometimes it still frustrates me that I can follow a recipe perfectly and then the bread doesn’t turn out because I let it over-proof, or the yeast died because the milk I used for proofing was too hot, or there wasn’t sufficient gluten formation, or the kitchen was too cold, or I scored the dough too deeply/too shallowly or any number of other confounding factors. There are just so many variables to consider. It definitely gets better the more familiar you become with baking, but a bread machine removes some of those variables. First of all, it mixes and kneads the ingredients together for you, and uses either all-purpose or bread flour, or some wheat flour. It provides the perfect temperature for the bread to rise. And it bakes the bread so it’s nice and soft. By taking out most of the variables, you are free to experiment with your recipe. What happens if you add more or less yeast? What happens if you add powdered milk? More or less salt? All-purpose or bread flour? Basically, a bread machine is foolproof: unless you do something very, very wrong, you will always end up with a loaf of (probably) edible bread. Or at least a doorstop in a bread loaf shape. 2. The bread will ALWAYS rise unless you forget the yeast. This point is related to the first one. When I talk to other bakers who specialize in chemically leavened baked goods such as cookies, cakes and quick breads, they often tell me that yeast scares them. What they mean is: with most baked goods, the baker is in control. With yeast, the yeast is in control. How long will it take to rise a loaf of bread? You can sorta judge it by the amount of yeast you use, but it’s not an exact science the way baking powder and baking soda are. Yeast can take more or less time to rise based on: the amount of sugar in the dough, the temperature of the room where it’s rising, the humidity, the amount of yeast, how much gluten formation has occurred, etc. A bread machine creates a hot, humid environment that is perfect for yeast to rise. If you add the right amount of yeast that the bread machine recipe calls for, your dough will always rise. 3. Can set it and forget it. 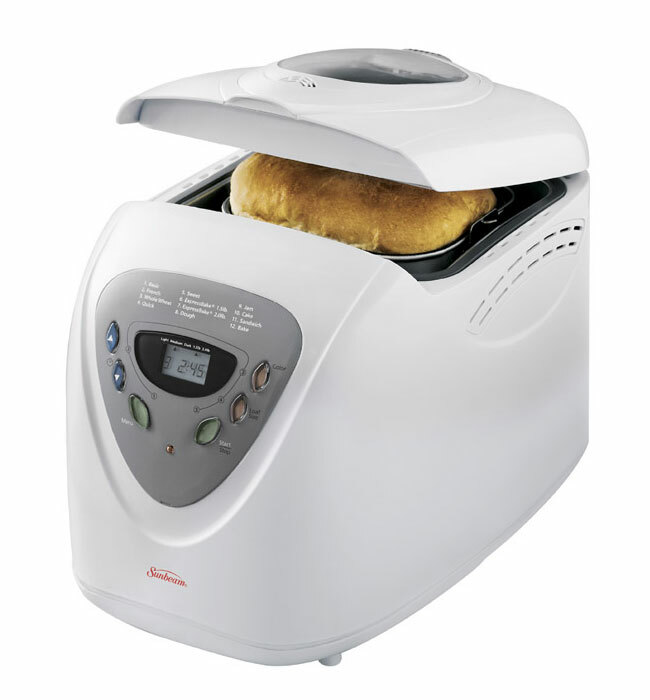 Some bread machines allow you to set a timer so you wake up to fresh-baked bread. Most bread machine recipes only call for non-perishables like flour, water and dried milk, so there’s no risk of spoiling or becoming tainted at room temperature. Also, starting from the moment you add the ingredients until the bread is finished baking, you don’t have to do ANYTHING. How amazing is that? I imagine it would be great for people like firemen or midwives who might get called away in the middle of baking for a job and not being able to come back to tend to the dough for hours. With a bread machine, they know the bread won’t overproof or get burned in the oven, because most bread machines have an automatic shut-off feature as well. 4. Always have bread on hand and save money. If owning a bread machine means you can stop buying bread or at least lessen the amount of store-made bread you buy, it will be a success. If you buy a $35 bread machine, it’ll pay for itself after only a few loaves. 5. Build confidence. This is so key. One of the issues with baking is that you get better the more you do it. Most people don’t have the resources or time to throw out tons of mistakes. 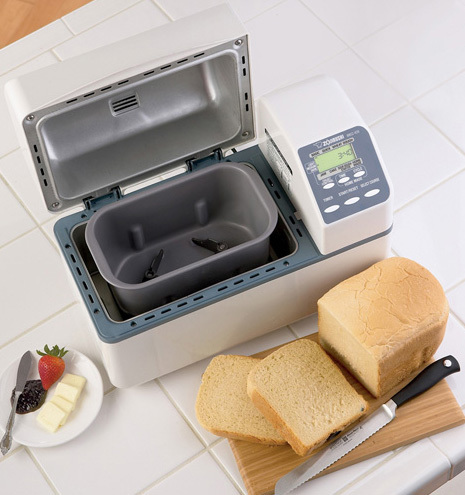 With a bread machine, you can start making tasty bread on day one. It certainly gave me the confidence to move away from using it after a year. 6. Economical way to bake. For someone without access to an oven, it’s a cheap way to have fresh-baked bread. 7. Leaves the oven free for other things. A few days ago, my bread didn’t brown properly because I let Mr. Bread Maiden warm up a plate in the rack above it. There are some days (this always happens on Thanksgiving) where we have to juggle oven use because a dish cooks at one temperature and the bread bakes at another. A bread machine circumvents that. So if I liked it so much, why did I end up selling it after a year? Several reasons. 1. Huge contraption that does only one thing. No matter which bread machine you buy, it’s going to take up a ton of space, both on your counter and in your cupboard. And, as Alton Brown might say, it’s a uni-tasker. Most people just don’t have the space in their kitchen for something that can’t be used lots of different ways. 2. It makes good bread up to a certain point. 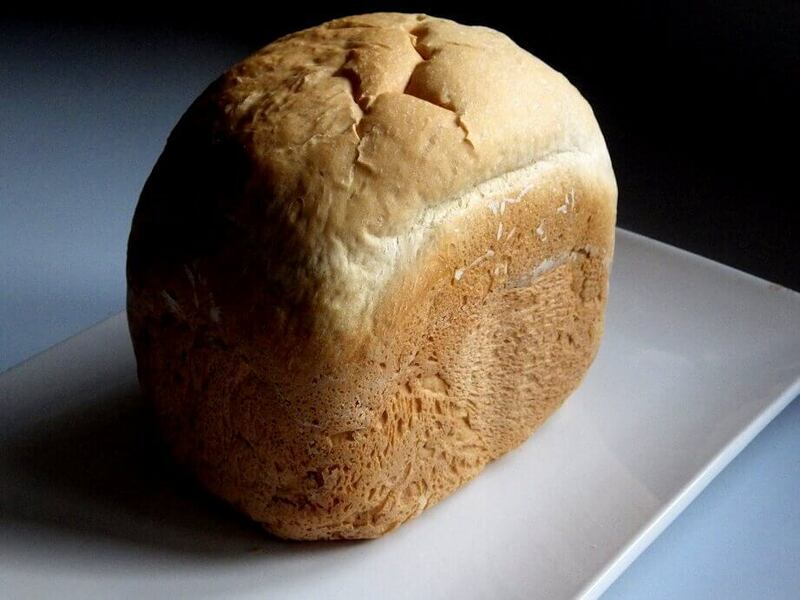 If you are used to eating commercial sliced bread, bread machine bread will be a revelation. But after eating many loaves, it gets… boring. I’ll go into more detail about what I mean below. It makes good bread, which is a selling feature. But you will never make GREAT bread with a bread machine. 3. Have to use bread machine-specific recipes. As I briefly mentioned above, a great feature of a bread machine is that you can follow a recipe exactly and have faith that it will turn out exactly as you want it to. But you have to use recipes tailor-made for a bread machine. That means recipes with lots of yeast (because the rise time is short), flour that has high protein content (because, once again, short time for gluten to form), and low hydration (about 66%) because the temperature that the bread machine bakes at is pretty low. As long as you use these bread machine recipes, you will get the expected results. But after a year, I was excited to try something new. 4. Can’t rise longer than the allotted time. As you may know, tasty lean breads like sourdough benefit from a long rise time. 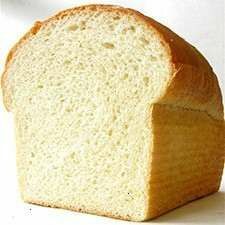 This is because yeast, as it eats the sugars in the flour, releases carbon dioxide and ethyl alcohol. Ethyl alcohol lightly ferments the dough, giving it more flavor. Bread machine bread only rises for about 1.5 hours, so any flavor must come from additions like milk, dried fruit, or spices. Because of the short rise time, all recipes will require more yeast. That means that any lean bread you make will taste primarily like yeast since you haven’t added anything else to cover the flavor. That’s not the worst thing ever, but again, after a year I was ready for new flavors. 5. Limited recipes. Can’t make sourdough. Can’t make 100% whole wheat or 100% rye without adding vital wheat gluten. Can’t add eggs, butter or liquid milk. 6. No crispy crust or big holes in the crumb. This is because the bread machine bakes bread at (estimated) 350 degrees F. Good for soft crust, bad for crispy crust. Also bad for big holes in the interior of the bread (called the crumb). So don’t expect baguette-like creations from your bread machine. 7. Weird shape with paddle hole in the bottom. If you couldn’t already tell from the pictures in this post (particularly the one at the top of the post), most bread machines produce a loaf that is tall and rectangular. It looks a little funny. Plus, the kneading blade at the bottom of the loaf pan doesn’t have anywhere to go, so it gets baked in and trapped in the bottom of your loaf. Not a deal breaker, but it’s a little weird. 8. Can’t make other shapes besides this one. This was a little bit of a deal breaker for me. 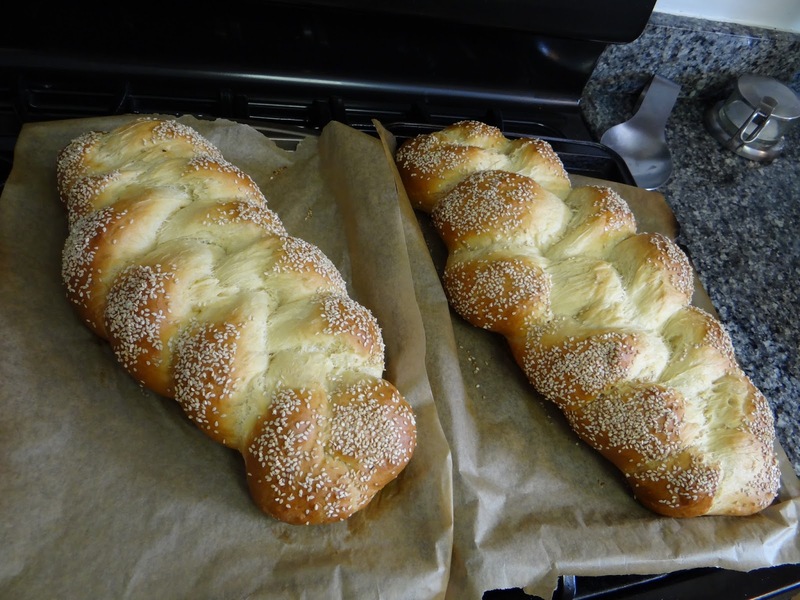 Once I could make loaves of bread, I wanted to branch out to other things- rolls, for example. Or baguettes. Or basically anything else besides a taller-than-normal sandwich loaf. Does anyone really think you can bake any of the breads seen in the foreground in a bread machine? In the end, the bread machine served its purpose. After using it to bake for a year, I had the confidence to branch out to regular baked bread, getting my fingers into the dough to knead it, and experimenting with different hydrations and long rise periods. If, after reading this post, you think you’d like to buy a bread machine, I’d recommend getting a used one on Craig’s List. Most are hardly used, and even mine which underwent heavy use during the year looked nearly brand new when I sold it. If you love using it, that’s great. If it gives you the confidence to give it away in the end, that’s all to the good. As the Bread Maiden, I think any time you make fresh-baked homemade bread it will be 100x tastier and healthier than what you buy in the store. Hate to break it to you but… you cannot make a swirled loaf in a bread machine. 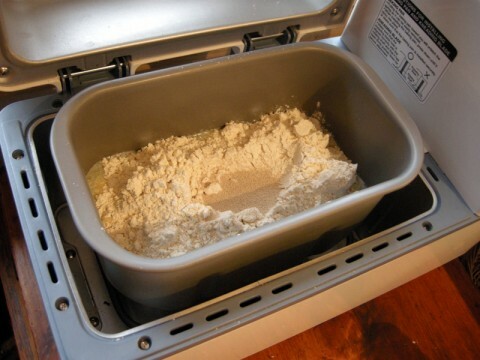 So there you are… why I loved my bread machine and why I ditched it. 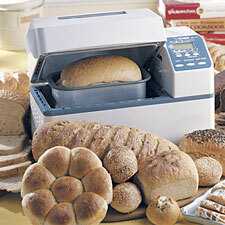 Did/do you own a bread machine? What do you like or dislike about it? Please feel free to leave me a comment below! For me I love my bread machine, but only for making a lot of bread quickly for guests (like for sandwiches), or to make pizza dough or roll dough. Big downside for machine loaves is flavor development is mediocre within the confines of the device and it's programming.